2018 Palomino Mare by WEG Gold Medalist, Yellow Jersey, out of Shiney Enterprise. Shiney Enterprise (Smart And Shiney x My Royal Enterprise) is an earner of $73,691, among her accolades are NRBC Non Pro Classic Reserve Champion, NRHA Derby Non Pro multiple top five, and AQHA Reserve Champion. Her progeny earnings exceed $21,000. 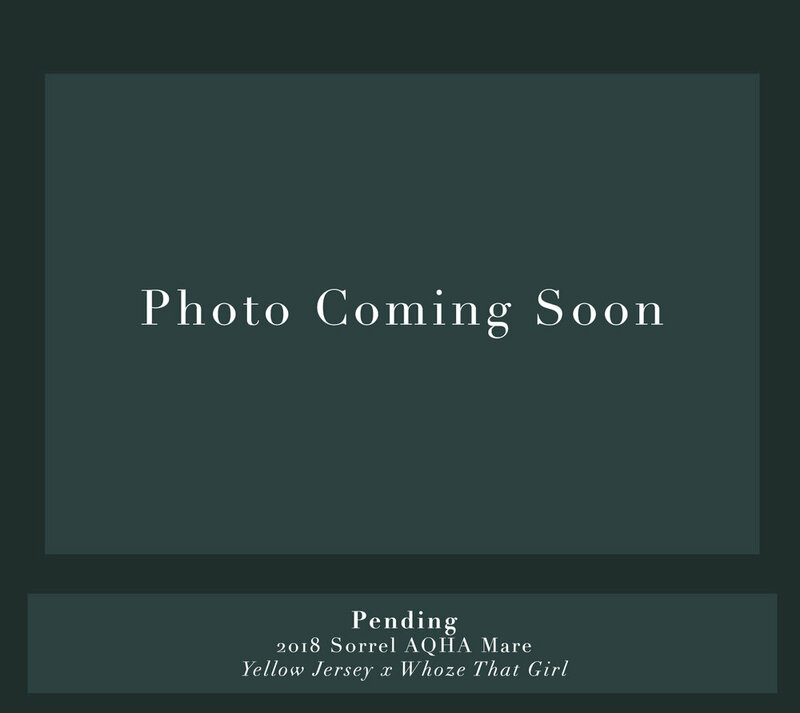 2018 Sorrel Mare by WEG Gold Medalist, Yellow Jersey, out of Whoze That Girl. Whoze That Girl (Colonels Smoking Gun x Shiney Enterprise) is an NRHA money earner. 2018 Sorrel Stallion by Gunners Tinseltown, earner of $316,233, out of Dun Its Deja Vu. Dun Its Déjà Vu (Hollywood Dun It x Miss Okie Too) is an earner of $26,288 and has produced earners of $192,116. 2018 Chestnut Mare by $1 Million Sire Gunners Special Nite out of Shiney Enterprise. Shiney Enterprise (Smart And Shiney x My Royal Enterprise) is an earner of $73,691, among her accolades are NRBC Non Pro Classic Reserve Champion, NRHA Derby Non Pro multiple top five, and AQHA Reserve Champion. Her progeny earnings exceed $21,000. 2018 Sorrel Stallion by $1 Million Sire Gunners Special Nite out of Shiney Enterprise. Shiney Enterprise (Smart And Shiney x My Royal Enterprise) is an earner of $73,691, among her accolades are NRBC Non Pro Classic Reserve Champion, NRHA Derby Non Pro multiple top five, and AQHA Reserve Champion. Her progeny earnings exceed $21,000. 2018 Sorrel Stallion by $10 Million Sire Colonels Smoking Gun out of Shine Ann. Shine Ann (Shining Spark x Lil Miss Smarty Chex) has progeny earnings of $86,029 and is a 2018 Top Ten NRHA Leading Dam. 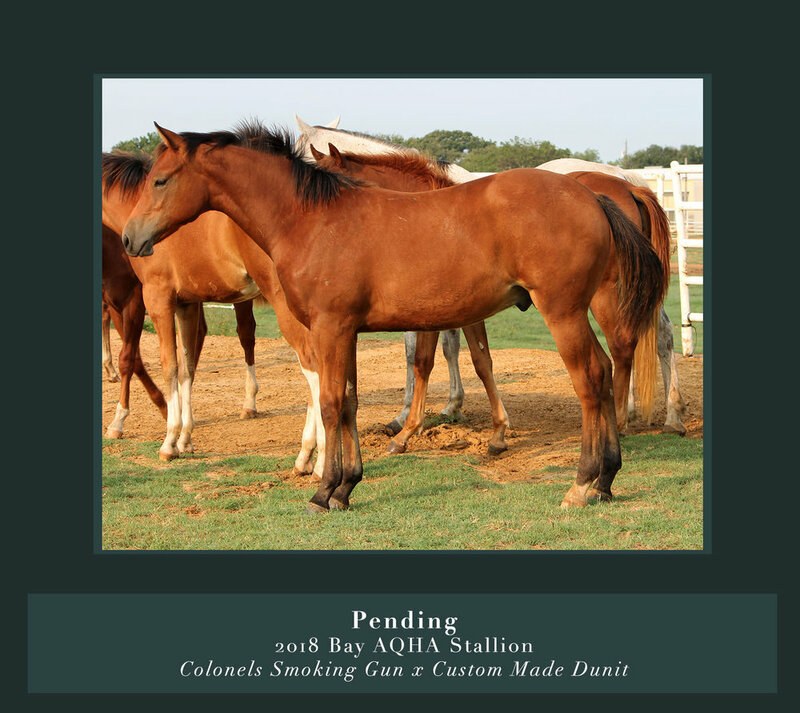 2018 Bay Stallion by $10 Million Sire Colonels Smoking Gun out of Custom Made Dunit. Custom Made Dunit (Hollywood Dun It x Custom Red Berry) is an NRHA money earner and producer of $299,155, including the 2012 Non Pro Futurity Co-Champion, Customized Gunner and the 2015 NRBC Non Pro Co-Reserve Champion Custom Made Gun. 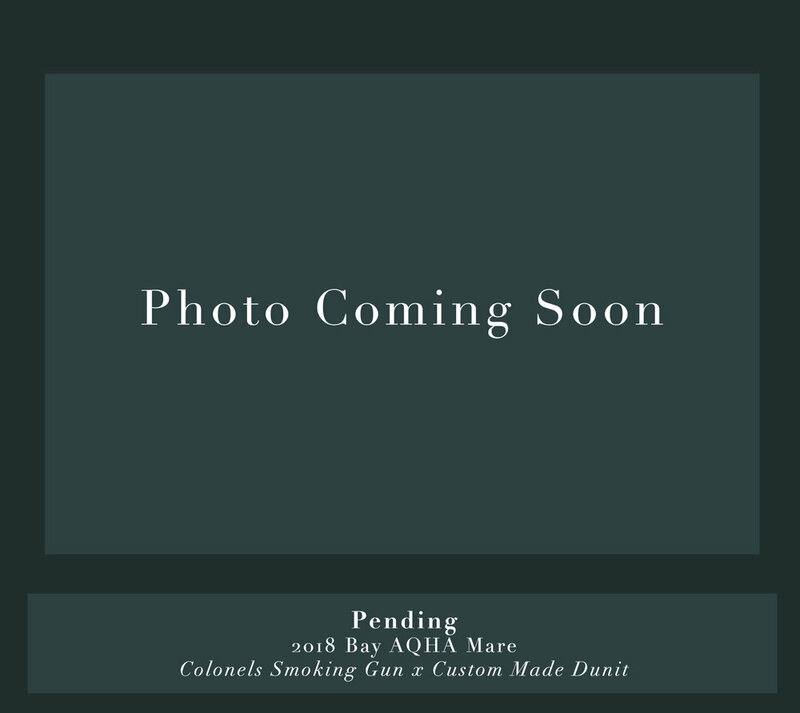 2018 Bay Mare by $10 Million Sire Colonels Smoking Gun out of Custom Made Dunit. Custom Made Dunit (Hollywood Dun It x Custom Red Berry) is an NRHA money earner and producer of $299,155, including the 2012 Non Pro Futurity Co-Champion, Customized Gunner and the 2015 NRBC Non Pro Co-Reserve Champion Custom Made Gun. 2018 Sorrel Mare by Mister Nicadual, producer of $460,000+, out of Customized Gunner. Customized Gunner (Gunner x Custom Made Dunit) won multiple Non Pro Champion titles and has earnings totaling over $93,000. Her oldest foal was born in 2014 and has already won over $22,000! 2018 Sorrel Stallion by WEG Gold Medalist, Yellow Jersey, out of Gunners Dollface. Gunners Dollface (Gunner x Sidewinders Doll) is the producer of $45,324. 2018 Sorrel Mare by Hollywood Dun It out of Shiney Enterprise. Shiney Enterprise (Smart And Shiney x My Royal Enterprise) is an earner of $73,691, among her accolades are NRBC Non Pro Classic Reserve Champion, NRHA Derby Non Pro multiple top five, and AQHA Reserve Champion. Her progeny earnings exceed $21,000. 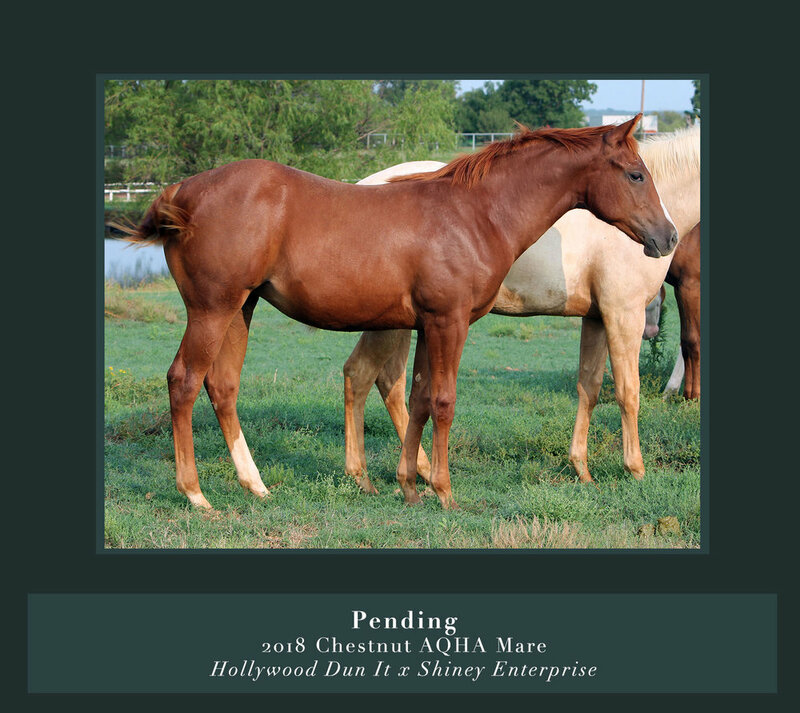 2018 Red Dun Mare by Gunners Tinseltown, earner of $316,233, out of Rio Dun Good. Rio Dun Good (Hollywood Dun It x Miss Dutari Rio) is an earner of $52,817 and producer of $54,035+. 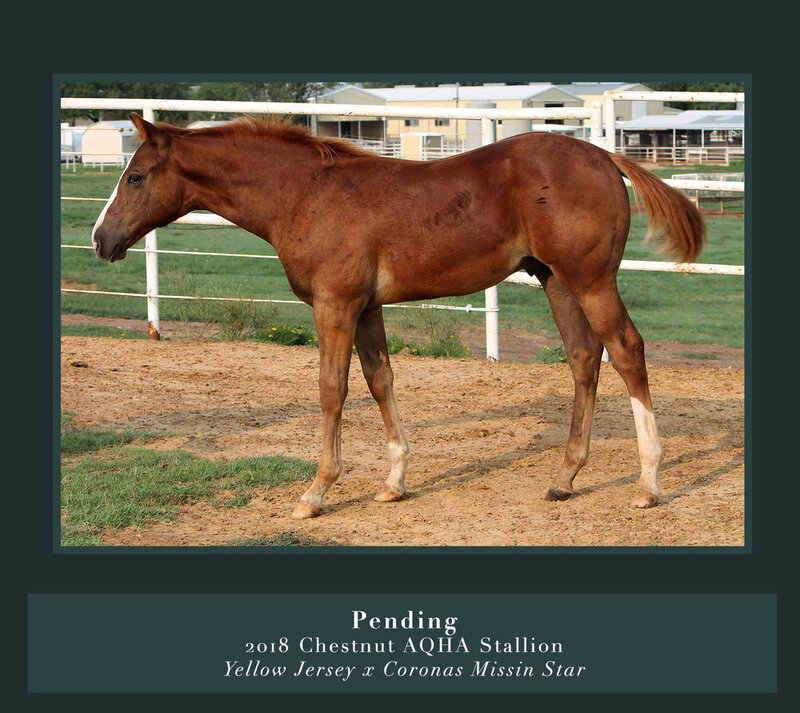 2018 Chestnut Stallion by Yellow Jersey out of Coronas Missin Star. Coronas Missin Star (Missin James x Coronas Vogue) has earnings totaling $209,063, including 2002 NRBC Non Pro Champion, and she is the producer of over $216,000. 2018 Sorrel Mare by WEG Gold Medalist Yellow Jersey out of Myskirtisinthedirt. Myskirtisinthedirt, (Jerry Lees Surprise x Just Like Jayne) is the earner of $12,366 and has produced $4,887. 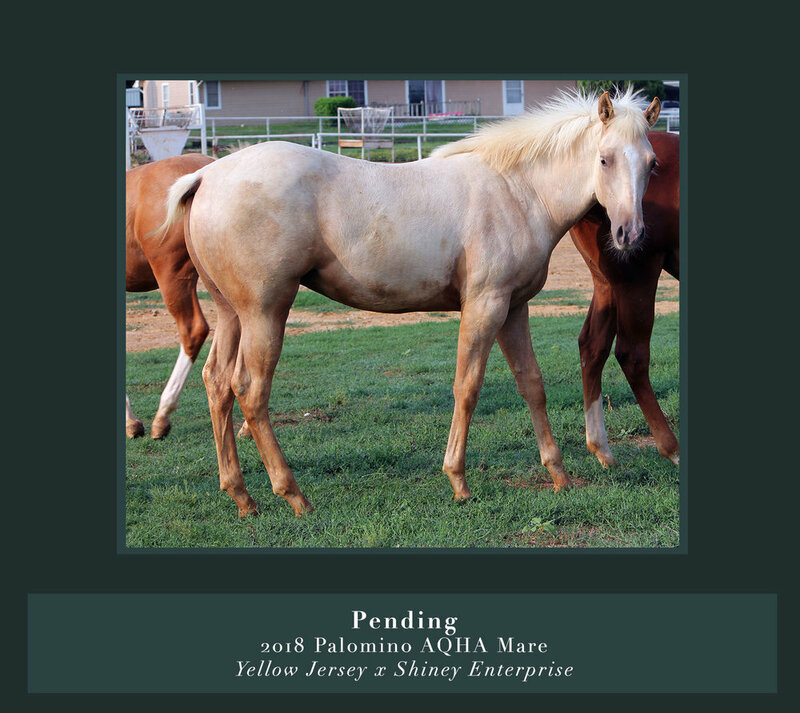 2018 Palomino Mare by Yellow Jersey out of Coronas Missin Star. Coronas Missin Star (Missin James x Coronas Vogue) has earnings totaling $209,063, including 2002 NRBC Non Pro Champion, and she is the producer of over $216,000.